Somewhere around one hundred years spanned the distance between the first biologically safe transporters and the launch of NCC-1701. Dr. McCoy was, perhaps reasonably, afraid—there were still problems: TOS The Enemy Within. Presumably, there were also Mark I, II, III and IV releases, unless some were skipped à la Windows. Also, Emory Erickson, the transporter inventor, must have had a number of pre-deployment alpha and beta versions. I know of at least two, detailed in ENT: Daedalus. Various risks have been described, including transporter psychosis (ENT: Realm of Fear), total materialization failure for a variety of reasons (Star Trek: The Motion Picture), merging of two people during transport (Voy: Tuvix), and regression during materialization to childhood (TNG: Rascals). These risks are described as having decreased over time. But how much safer was the technology in the later (in-universe chronology) episodes than when first deployed? Is there evidence beyond what La Forge and O'Brien said anecdotally? There were enough late accidents to make me think that transporters must have been very dangerous in the beginning. Not that this really proves anything, but extrapolating from Richard's detailed answer to this related but separate question, and adding in the accident from Star Trek: The Motion Picture, I count four known accidents from before TNG and seven from TNG on. 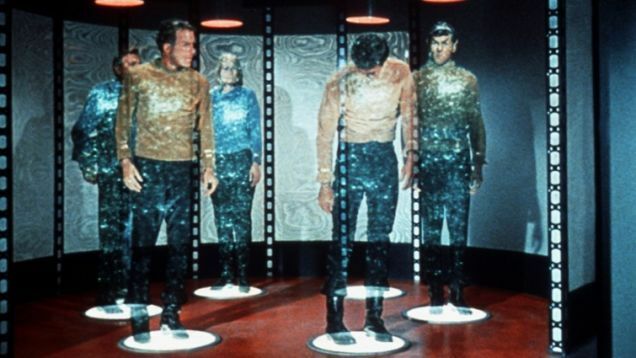 But it would be silly to think that transporter technology had become riskier over time, right? ARCHER: I have to confess, given a choice, I'd much rather use a good old-fashioned shuttlepod. EMORY: I'll never forget the protests when the transporter was first approved for bio-matter. DANICA: Oh, God. Here we go. EMORY: People said it was unsafe, that it caused brain cancer, psychosis, and even sleep disorders. And then there was all that metaphysical chatter about whether or not the person who arrived after the transport was the same person who left, and not some weird copy. TUCKER Which would make all of us copies. EMORY: I had to fight all of that nonsense, and I'm not going to tell you there weren't costs. I'm living proof of that, but I won. Mankind is better off. Makes everything I've fought for worthwhile. EMORY: I sympathise, believe me. During the initial tests for the transporter, some brave men and women were lost. Not a day goes by that I don't think about them. How can I help? In particular, his own son Quinn was lost in such an accident, and his pattern was trapped in a subspace anomaly for 15 years. In the episode, they manage to rematerialize him, but he dies a few moments later. So, anecdotally, it would seem that the risk of using the transporter has diminished significantly since Archer's generation.